Lyons PR was recognized by Maryland’s Public Relations Society of America with their Best in Maryland and Award of Excellence for two of their respective campaigns. Maryland PRSA’s “Best in Maryland Awards Gala” is PRSA Maryland Chapter’s premier event that recognizes excellence is strategic and influential public relations programs and tactics. 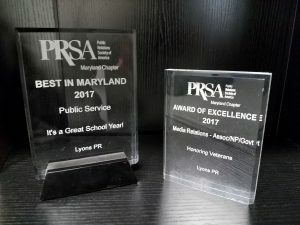 For their work in the past year, Lyons PR was awarded two of the prestigious awards: an Award of Excellence for their Satellite Media Tour on behalf of the U.S. Department of Veterans Affairs and a Best in Maryland Award for their Public Service Announcement campaign on behalf of the National Education Association.